In spring 1974, a number of farmers near Xi’an (a famous Chinese cultural city) discovered some ancient bronze weapons and pieces of broken terra-cotta armoured warriors while sinking a well. This turned out to be one of the most amazing archaeological discoveries of the twentieth century. Excavations since then have found 1800 terra-cotta warriors although it is estimated that there are at least 6000 more still to be excavated. 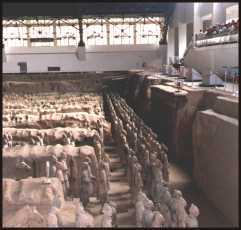 The terra-cotta warriors are in battle formation and include cavalry, infantry and charioteers. They are a replica of the Qin army and were created over 2200 years ago. A high level of technological skill was needed for this to be possible. This ancient society was powerful and technologically advanced. Qin Shi Huang (259-210BC) was the first emperor of the Qin Dynasty and he was the founder of China’s first empire. He expanded his military strength building an army of one million professional soldiers. He started the construction of the Great Wall. In preparation for his death he built a replica of his kingdom underground and he was finally laid to rest in the underground palace at its centre. It took over 720 000 people, 37 years to build. The terra-cotta army were created to defend his underground kingdom from attack. When they were first found it was believed that the terra-cotta warriors are all individually designed, based the faces of the Emperors actual soldiers. However, it has since been proved that all the soldiers are based on ten basic designs. 1. On a map of China, find the location of Xi’an. Draw a simple map showing its position in China. 2. 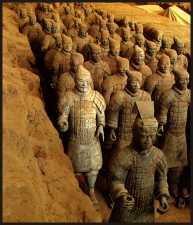 Explain why the Emperor Qin ordered the creation of the terra-cotta army. 3. Research the terra-cotta army using the internet, library etc... carefully present this research and explain where you found the information.